These elite German soldiers were known for their experience and were deployed heavily during Operation Michael. These soldiers often included some of the most battle-hardened men on the Western Front. 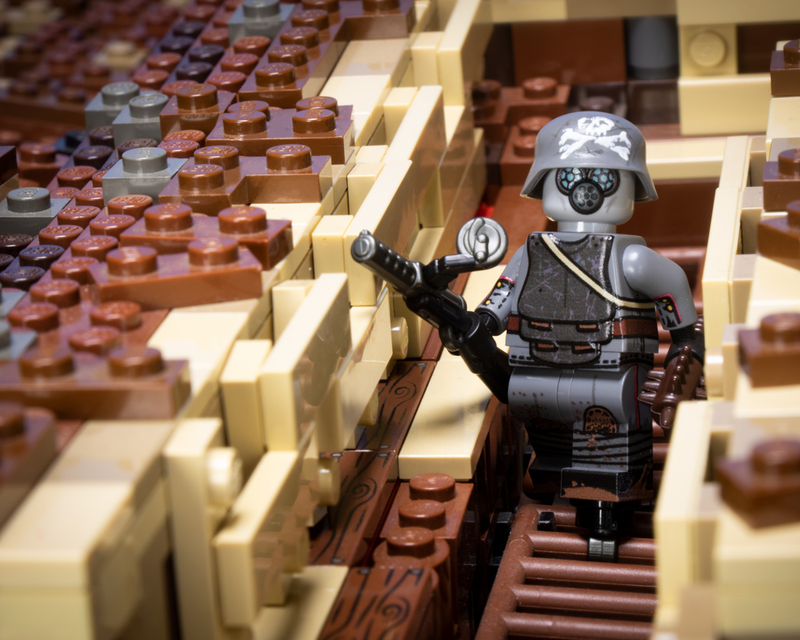 Typically seen with the MP-18 submachine gun, these soldiers were used to exploit weak points in the Allied trenches. This custom-printed minifigure includes an Overmolded BrickArms MP-18 with exclusive color scheme, a BrickArms trench mace, and a custom-printed display stand with textured details. The WWI German Stormtrooper has artwork based on trousers with reinforced knees, field tunic, Krupp Sappenpanzer (Trench Armor) Type 1, field-painted gas mask canister, Stielhandgranate, M1907 Canteen, German gas mask, and field-painted Stahlhelm. The gas mask and trench armor also feature texture printing.